Cincinnati Milacron Arrow 1250C 4-Axis CNC Vertical Machining Center s/n 7064-AOO-98-0006 w/ Acramatic 2100 Controls, Hand Controller, Renishaw TS27R Tool Touch Probe and Wear System, Renishaw M18 Probe Interface, 21-Station ATC, CAT-40 Taper Spindle, USB Port, 24” x 54” Table, Coolant. 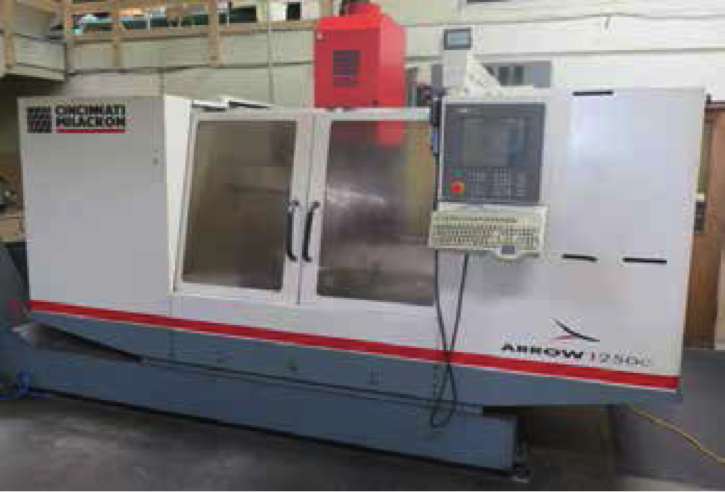 Cincinnati Milacron Arrow 500 4-Axis CNC Vertical Machining Center s/n 7042-AOB-98-1717 w/Acramatic A2100 Controls, Hand Controller, 21-Station ATC, CAT-40 Taper Spindle, 20 ½” x 27 ½” Table, Coolant. Japax LDM 50 mdl. Z CNC Wire EDM Machine s/n 940-00-454 w/ JAPT 4G Controls, Remote Controller, 13” x 24” Work Area, 18” x 32” Table Area, Dielectric Coolant System. Japax LDM 35 CNC Wire EDM Machine s/n 939-02-038 w/ JAPT 4G Controls, Remote Controller, 12” x 15” Work Area, 17” x 22” Table Area, Dielectric Coolant System. Edmas Inc “ED Boring” 3kVA EDM Drill s/n BM-1003 w/ Digital Controls, Mitutoyo KL Counter Programmable DRO, 10” x 19 ½” Table, Coolant. (2) Elox Workmaster 45 Die Sinker EDM Machines w/ Elox Futura Controls, Coolant System, Halon Auto Fire Suppression System. (3) Japax “Electroder” EMM30 2-Station NC Electrode Cutting Machines s/n’s E18-01-115, E18-01-106, 08-01-038 w/ JAPT-3F Controls, Coolant. Japax “Electroder” Single Station NC Electrode Cutting Machine w/ JAPT NC3 Controls, Coolant. Japax mdl. L450 and L350A Wire EDM’s w/ JAPT Controls (FOR PARTS). Lodge &amp; Shipley AVS 25” x 54” Lathe s/n 48687 w/ 25-1500 RPM, Inch Threading, Tailstock, 2”Thru Spindle Bore, Indexing Tool Post, Trava-Dial, 16” 3-Jaw Chuck. Lodge &amp; Shipley AVS 21” x 56” Lathe s/n 45953 w/ 34-2000 RPM, Inch Threading, Tailstock, Steady Rest, 2” Thru Spindle Bore, Indexing Tool Post, Trava-Dial, 12” 3-Jaw Chuck. Cincinnati “Toolmaster” Vertical Mill s/n 5531D5W-0062 w/ 85-3800 Dial Change RPM, 40-Taper Spindle, Box Ways, 10” x 48” Table. Bridgeport Vertical Mill s/n 96431 w/ 1Hp Motor, 80-2720 RPM, 8-Speeds, 9” x 32” Table. (2) Gorton “Mastermill” mdl. 1-22 Vertical Mills w/ 650-4600 Dial Change RPM, 40-TaperSpindle, Box Ways, Gorton Dyna Drive II Power Feed,10” x 42” Table. Gorton Vertical Mill s/n 18603 w/ 420-2050 RPM, 7-Speeds, Power Quill, 10 ½” x 41” Table. Blanchard 22-44 42” Blanchard Grinder (Rotary Surface Grinder) s/n B43- 11-610 w/ 6-33 Table RPM, 42” Electromagnetic Table, 22” Grinding Head, Coolant. K.O. Lee mdl. B860-3-52 Tool and Cutter Grinder s/n 4244. Greenfield Tap &amp; Die Co Tool and Cutter Grinder w/ 3” x 22” Table. Darex SP-2000 Precision Drill Sharpener. Baldor 8” and 6” Pedestal Grinders. Cincinnati Bickford “Super Service” 10” Column x 20” Radial Arm Drill w/ 16-1800 RPM, Power Column and Feeds, 24” x 10” x 20” Riser Fixture Table. Cincinnati Bickford 9” Column x 24” Radial Arm Drill w/ 75-1500 RPM, Power Column and Feeds, 16” x 10” x 22” Riser Fixture Table. Cincinnati Bickford “Super Service” Deep Hold Drill Press w/ 75-1500 RPM, 16” x 24” Table. DoAll mdl. HP-36 36” Sliding Table Vertical Band Saw s/n 31-52847 w/Blade Welder, 70-15,000N Variable RPM, 36” x 44” Power Feed Table. DoAll mdl. 1611-H 16” Vertical Band Saw s/n 258-68159 w/ 50-5200 Variable RPM, 24” xDelta 13” Vertical Band Saw. UFM Uni-Hone mdl. 3600C Dry Blast Cabinet s/n 3600C381298 w/ Dust Collector. (3) Rockwell Delta Pedestal Drill Presses. Craftsman Bench Model Drill Press. Starlite mdl. PR2 Pneumatic Die Filer. (2) Oliver mdl. HDFILER Die Filers. Miller Dynasty 280 Arc Welding Power Source s/n MF270191L w/ Miller Coolmate 1.3 Cooling Unit and Cart. Atlas Copco GA15 15Hp Rotary Air Compressor s/n AII248678 w/ Elektronikon Digital Controls, 80 CFM @ 132 PSIG, Refrigerated Air Dryer, 240 Gallon Air Storage Tank. 7.5Hp Horizontal Air Compressor w/ 80 Gallon Tank. (2) Huot Tool-Scoot 40-Taper Tooling Carts. 9” and (3) 6” Machine Vises. Troyke 20”, (4)18” Rotary Tables. Kennedy and Craftsman Roll-A-Way Tool Boxes. Scherr Tumico 14” Optical Comparator. Wilson mdl. 4JR Rockwell Hardness Tester s/n 5246. Mitutoyo and Starrett OD Mics to 20”. 24” x 36” x 4” Granite Surface Plate. Caterpillar T40E 4250 Lb Cap Short Mast LPG Forklift s/n 5HD00218 w/ 2-Stage Short Mast, 82” Lift Height, Cushion Tires. 2006 Ford F-250 XL Super Duty Pickup Truck Lisc# 8E83718 w/ 5.4L 3V Triton Gas Engine, Automatic Trans, AC, 266,165 Miles, VIN# 1FTNF20516EA24508. 1974 Ford 12’ Stake Bed Truck Lisc# 46237W VIN# F37YRU03123. Lester Electrical mdl. 06640 12 Volt Scooter Cart. National Crane ½ Ton Floor Mounted Jib w/ Chain Hoist. Floor Mounted Jib w/ Budget ½ Ton Electric Hoist.